For many, the daily visit from the postman, or trip to the post office to collect mail from the post box is of no significance. However, for those who live in isolated area, the weekly (or sometimes less often) delivery of mail and supplies is an event of importance! For many this is the only link with the outside world for extended periods of time. Today I am Sharing my memories of our outback mailman. I can still remember the excitement I used to feel, when we caught a glimpse of the cloud of dust advancing along the road to Nuntherungie Station (this could sometimes be seen for quite a few miles), that signaled the imminent arrival of the mail truck. Nuntherungie Station was between Broken Hill and White Cliffs and the mail truck would arrive at our homestead on Saturday mornings, dropping of mail and supplies on its way through to White Cliffs. The first mailman that I can remember as a young girl was Mr Vincent, a short slightly rotund gentleman who was always dressed in overalls. 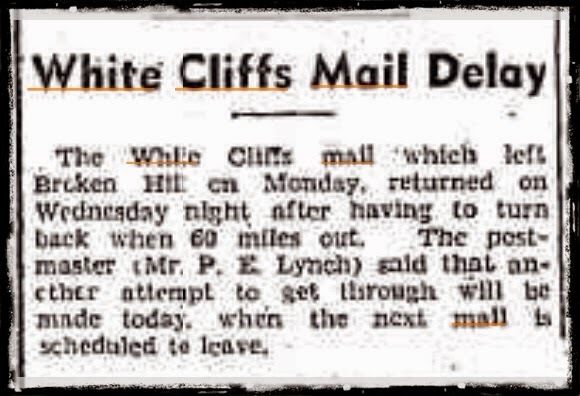 Every Friday he would load his truck with orders of bread, vegetables, fruit and other supplies, mail, newspapers and other supplies needed by the properties between Broken Hill and White Cliffs. He would set out along the red dusty road, stopping at all the Stations along the way. My sisters and I would await his arrival with great expectations, as he always had a small sweet treat for all the children along the way. I remember relishing the "Cherry Ripes" that he would pass around when he arrived. As was the bush custom, my mother would brew a pot of tea and have a nice slice of sponge cake, or scones ready for Mr Vincent's morning tea. My mother would enjoy the chat over a cup of tea with our mail man. Her life on a station was very isolated and it gave her a chance to catch up on news from Broken Hill, and the other properties along the road. Among the letters and newspapers there was our weekly subscription to comics for my sisters and I. I would be on the edge of my seat waiting for the next installment of the school girl mysteries in "Girls Own" and my sisters would pour over their new copies of the "Jack and Jill" comic books. Also included in our mail would be our next set of lessons from Blackfriar's Correspondence School. Our completed lessons from the previous week would be packaged up, ready for Mr Vincent to take back to Broken Hill, for posting to Blackfriar's head office in Sydney. The truck arrival also meant we would have fresh bread for our sandwiches. The fresh bread that arrived from the Broken Hill Bakery would have to last the week. So as you can imagine by the end of the week, toast was the best option. Though I do remember my mother wrapping the loaves in a damp tea towel and heating it int he oven to freshen it up a bit. Then there was the time when the rain came, and this quite often mean that the mailman would have difficulty getting through to make his deliveries, as the creeks would flood and roads would be cut. On these occasions, my father would sometimes have to drive through with the tractor and pull the mail truck through a flooded creek or two (or three!). Heavy downpours would mean that the mail sometimes didn't get through for a couple of days. Our outback mailman and his deliveries were very different to the mail delivery experienced by those living in town. He was more than the person who brought letters and parcels. His delivery of mail and supplies was also accompanied by news from the outside, a lolly shop experience for the kids and that little chat over a cup of tea for the isolated families along the dusty road between Broken Hill and White Cliffs. Gosh I know what you mean about the importance of these things Diane. I lived for 20 years in an area not all that far out of Melbourne. We had no gas, no water (tanks) and no sewerage (septic tank). Importantly we picked our mail up from the General Store. My kids were brought up thinking that was the norm until we moved and got our very own letter box with mail deliveries and the occasional junk mail even. My then 16 year old cracked everyone up by saying triumphantly at a family gathering that we have our own letterbox now - "and it works!" I can only imagine waiting a week for mail deliveries.